Snoring is not something that just starts happening, it builds up gradually over time and most people who snore either deny it or cannot remember exactly when they began to snore. Most people know they snore because of their partners in the same or even other members of the family in different rooms. At this stage many people will want to investigate how to stop snoring. In some ways, snoring is a warning sign of something that is out of kilter with your body functions. It tends to affect people listening to the snoring as much as the snorers who may have underlying medical conditions like sleep apnoea. Listening to snoring means quality of sleep is reduced so it is to everyone’s benefit that excessive snoring is investigated. There has been a lot of research into snoring in recent times which as discovered links to some serious medical conditions. Snoring can be triggered by various lifestyle choices such as smoking, drinking alcohol, poor diet, and obesity to name the most common ones. If these poor lifestyle choices are systematically worked through, health will improve and snoring is likely to stop or reduce to acceptable levels. Often quite small changes will bring about improvements. The mechanics of snoring can be explained simply. It is caused by physical obstruction of the airway during sleep. This obstruction occurs when the muscles and tissues at the back of the throat go into a relaxed state during sleep. When air moves across the relaxed tissues during inhalation, the tissues vibrate generating the incredible noise level, which can be a staggering 60 to 90 decibels. When you consider that sounds greater than 80 decibels are potentially hazardous to hearing, then it will come as no surprise that a chainsaw registers 90 decibels and a jet taking off registers 120 decibels. Snoring at these levels can disturb the snorer themselves leading to daytime fatigue and lack of proper rest. When sleeping on your back, gravity pulls the tongue, jaw down, and back. This causes the jaw to open and the tongue falls into the airway and narrows the airway. Most snorers only do so while sleeping on their backs. The most efficient way of breathing is through the nose. Various conditions such as a simple cold, broken nose, or allergies can cause inflammation or obstruction in the nasal airway that leads to mouth breathing and snoring. In overweight individuals, there may be excessive fat deposits around the neck and throat that increases the bulk of tissue around the airway. This causes the airway to narrow when lying down and breathing is restricted. Obesity is one of the predisposing factors to sleep apnoea. Some people have thick tongues, enlarged tonsils, or other mild conformational defects, which naturally causes a narrowed airway with snoring as the result. Receding chins, which are associated with small lower jaws, also predispose an individual to snoring because there is less room at the back of the throat for soft tissue and the tongue. Also in this category are children. Alcohol is a common cause of snoring as it over relaxes the soft tissues and muscles in the throat, which then narrows the airway during sleep and causes snoring. Certain drugs may cause the same effect particularly tranquilizers. Smokers usually have increased congestion in the nasal passages and increased mucous in the throat, which combined lead to increased snoring. There are many products and methods that offer solutions to how to stop snoring, but the first thing to do is to find out what type of snorer you are. If you know you have lifestyle choices to change then you can eliminate alcohol, drug, and cigarettes and lose weight if you are carrying excess pounds. These changes will result in a snoring reduction and make positive changes for health. Some people are particularly affected by the type of snorer they are. This can be because of mouth breathing, tongue position, or nasal obstruction. For snoring of these types there are some devices that will help with correct breathing such as nasal dilators or a mouth guard to keep the body breathing correctly without snoring. 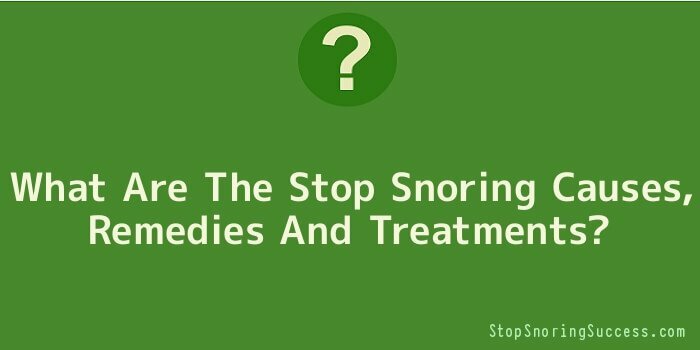 There are many well-known easy remedies to try for snoring such as sewing a tennis ball into the back of a pyjama top so the snorer is always rolled off their back thus preventing snoring. Singing for 15 minutes, a day is meant to help because it exercises the airways and muscles in the throat. Do not drink alcohol or eat heavy meals or snacks for at least four hours before bedtime and try to keep a regular sleeping pattern. Some people report good results with homeopathy. The most important thing is to see your doctor if you are concerned about your excessive snoring particularly if some of your changes have had no results. You may need to undergo a sleep study and have tests to monitor why it is affecting you so badly and for you to hopefully find out how to stop snoring.